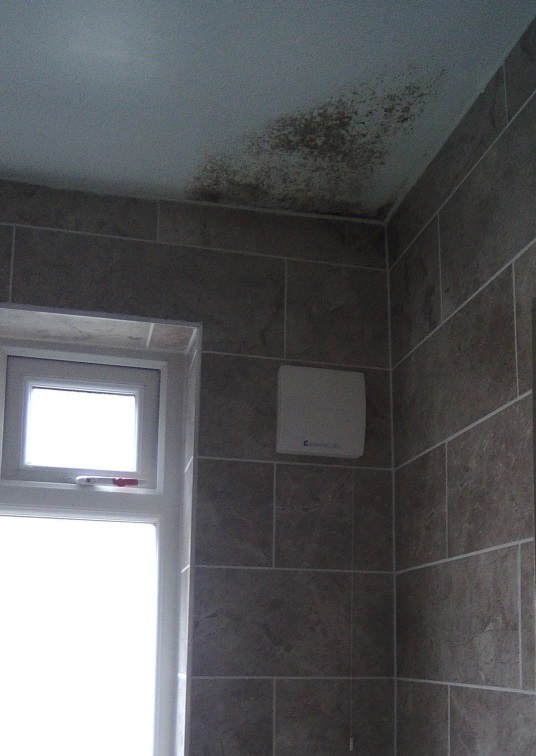 Kenwoods were called to a first floor flat in London following concerns regarding black mould. During the inspection black mould was found on the ceiling within the bathroom. Black mould occurs due to a build-up of condensation which is caused by excess moisture. Kenwood offer a wide range of products to combat condensation depending on the area affected and the severity of the problem. Unit just installed within a couple of weeks the mould will have dried out and can be cleaned off. Kenwood Humidivent© unlike standard extractor fans, do not required the occupant to turn on the light to operate. With no user controls to worry about, the unit will come on and turn off as required controlled by a humidistat which detects excess moisture vapour and activates to reduce the relative humidity and prevent condensation occurring.